Can someone tell me what Aimpoint mount is shown on the AR in the link below? I've been looking for a quick-release mount with a thumb screw like the one shown as opposed to the various throw-lever versions. I think its Aimpoints X-Wide mount. Can anyone confirm or correct that? It sure looks like it, just like the one that came with my CompC. That indeed would be the POS X-Wide Aimpoint ring. So it's on the "AVOID" list?? eh, not really on the "avoid" list, but I do think there are better mounts. We've sold a ton of them with zero complaints. You can't beat them for the money. 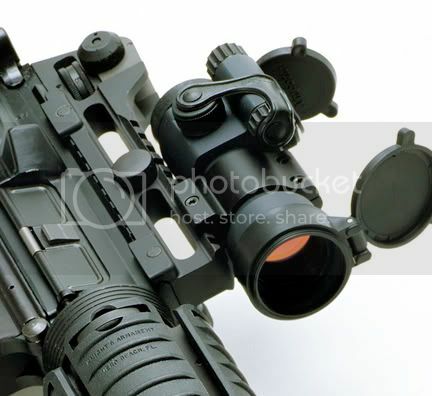 Check out our forum in the Industry section here at AR15.com and at OpticsTalk.com. The problem is trying to find something else that sits that low to the rail. I have my Aimpoint sitting on a RRA tactical carry handle and it co-witnesses perfectly with the BUIS but is not QR. Other QR models I've seen so far sit too high for what I need. I pretty much need something that is QR and sits right above the rail.